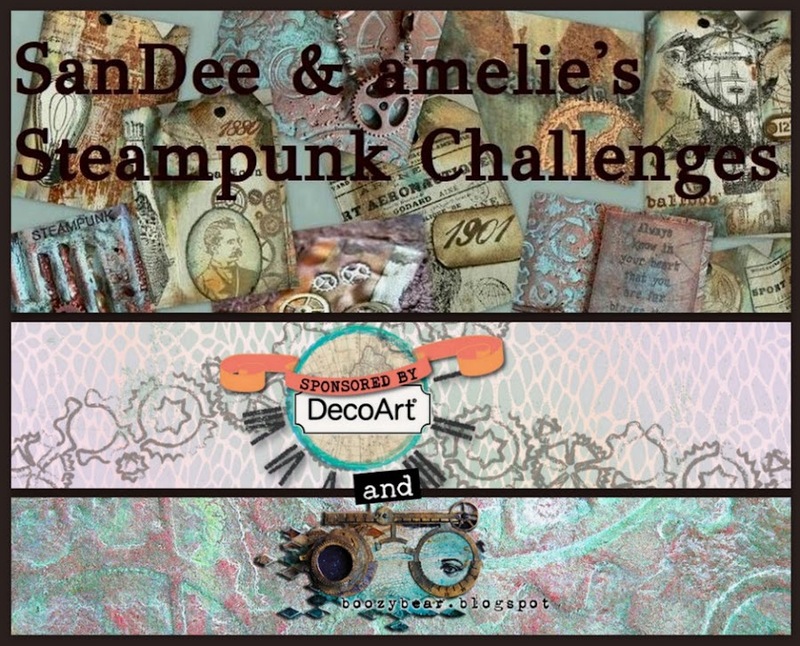 Hi and servus and welcome back to our little creative steampunk challenge corner! Team B are sharing their inspirational projects today (and if you haven't checked out the projects of team A yet I highly recommend you do so by clicking HERE). 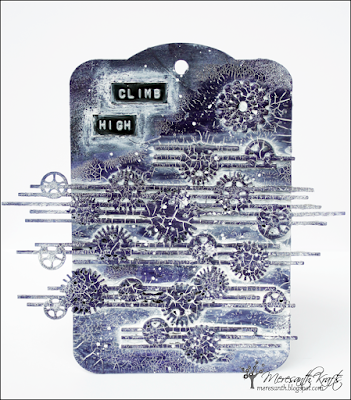 and I also tried stamping into modeling paste. because then you might staunch your creative flow. in combination with bold and bright. 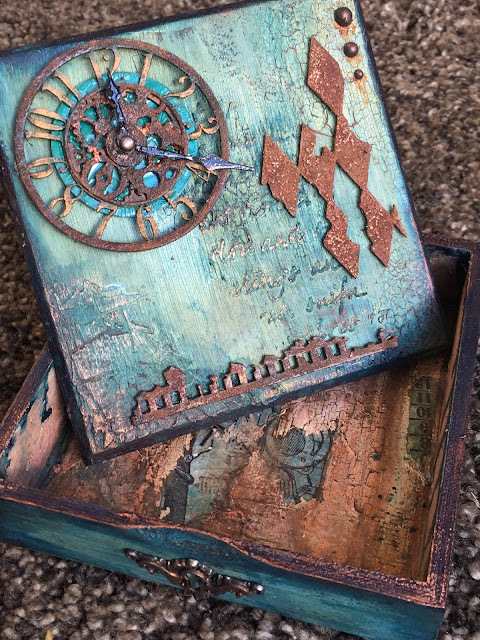 I have an altered wooden box for you today. 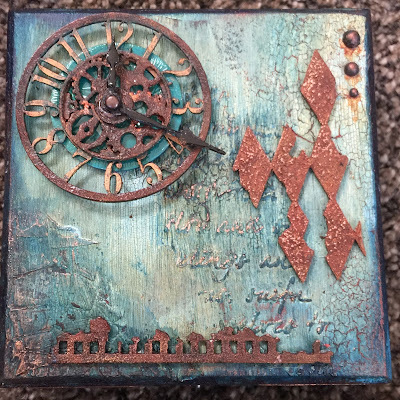 I used boozybear's Clock, Distressed Harlequin and Notebook. 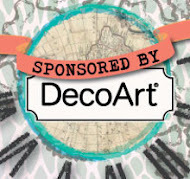 All this was created with Deco art products and boozybear chipboard pieces. 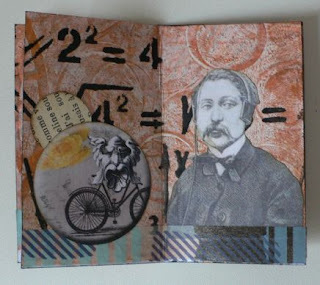 and created a little notebook for starters. 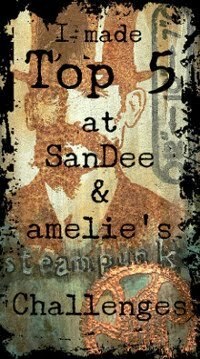 Servus, dear steampunk and industrial style crafters and friends! - and who made Top 5 of course. Congrats, ladies! 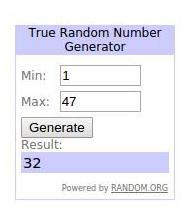 Have fun with your goodies and thank you so much for playing along! Please, email me your shipping adresses (DecoArt need the phone number too!) so we can have your prizes sent to you asap! And now on to our Top 5. As always the team and I were gobsmacked by all your entries! You all constantly invest such a lot of thought, love and labour into the projects you enter to our challenges - and that makes us feel truly blessed and proud! Thank you all so much! 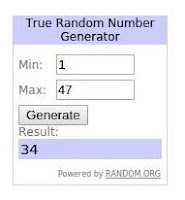 The Top 5 appear in order of their entry numbers. If you want to learn more about their winning projects, please, click their names to get to their blogs. Huge congrats from the SASPC team, ladies! Please, feel free to grab the Top 5 badge for display on your blogs! We hope to see you play along with us again soon! 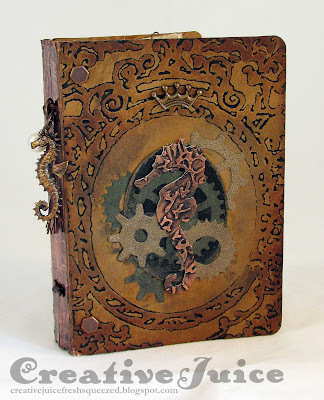 Our actual challenge has still three more weeks to go and the theme is "Anything Goes - Steampunk/Industrial" again. AND of course there are another two prize packs waiting for two randomly drawn players! So make sure you play along to get eligible (and to have fun of course ;). On 15th April team B will present their projects for this month to inspire you to join in. Please, make sure to check back then. 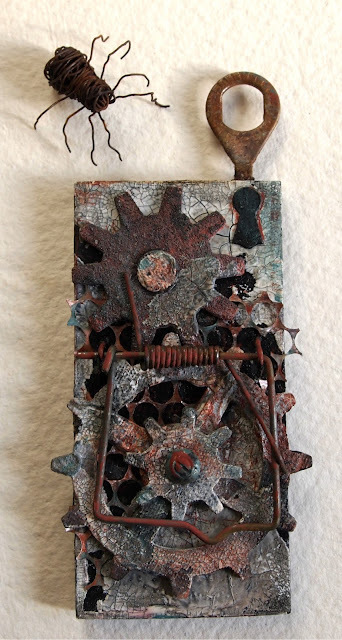 Servus, hi and welcome back to the start of another steampunk/industrial mixed media challenge! 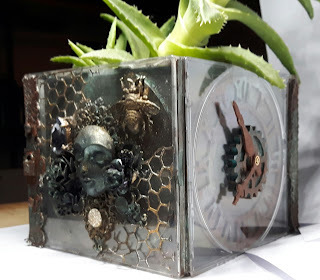 But before we plunge in medias res we want to say a huge thank you to all our true and also new players for playing along and sharing their awesome steampunk or industrial mixed media art with us each month! We are always amazed by all the fantastic entries and by the loads of love and labour that obviously went into all the projects entered to our challenges! This is what we hope and what we work for and seeing it come true is our greatest reward! Therefore also voting our top 5 really never is easy and the team and I try to do it with as much care and thought as possible. 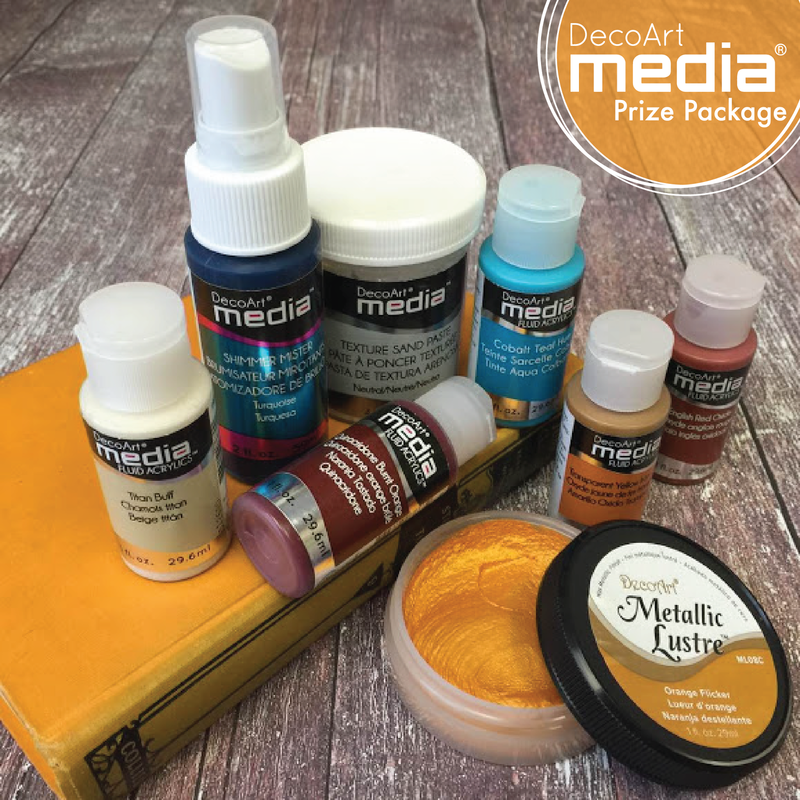 If you want to know which entries from our March challenge will make it to the top or who will be our prize winners check back on Saturday, 9th April! And Team A once more rocked this one out of the park! But see for yourselves (and don't forget to, please, visit the teamies' blogs and leave them a short "like it" or "thanks for the inspiration" comment to let them know you were there. You get to the blogs by clicking their names. To enlarge images simply click those). 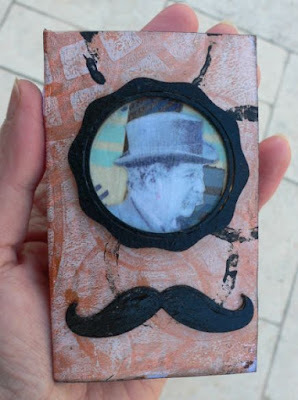 I recycled a box to lock in the famous magician Houdini! J' ai recyclée une boite pour y en fermer "Le Magicien Houdini "
During spring cleaning I found some items I used for this MouseTime! A simple crackled motivational tag. I made a motivational tag on desk. About spring new hope and goals when days are longer. - to be given away to two randomly drawn players. But as we have to be fair we can only give them away to those who have entered properly, please, make sure you have checked our few rules so disappointment for all sides can be avoided. 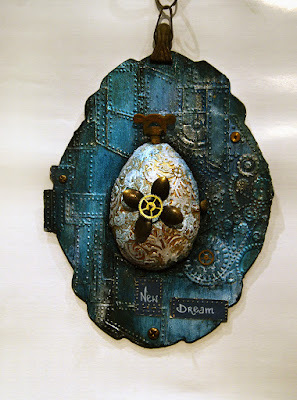 As usual the link up is open until the end of the month so there is enough time to get inspired and roll some ideas in your head before you get started. ;) And should you need another dose of inspiration make sure to come back on April 15th, when team B will present their makes! (well...even if you don't need any additional inspiration it will be worth another visit. I promise! lol). We hope to see you play along with us soon!